What is the LC Study Challenge? The Study Challenge is a four-week competition designed to help you become a more effective, successful student and learn more about campus and community resources. The 2018 Study Challenge will be September 3rd - 30th with tasks for you to complete every week with your team. The winning team from the 2018 LC Study Challenge, "Kansas" won iTunes giftcards and Roku Streaming Sticks! You can register as part of a team composed of 3-6 members by going to the 2018-2019 Learning Communities Canvas page and completing the Study Challenge Team Registration Form by 5 PM on Friday, August 31st. If you submit your team registration form past the deadline, 10 points will be deducted from your final score but you may still participate. 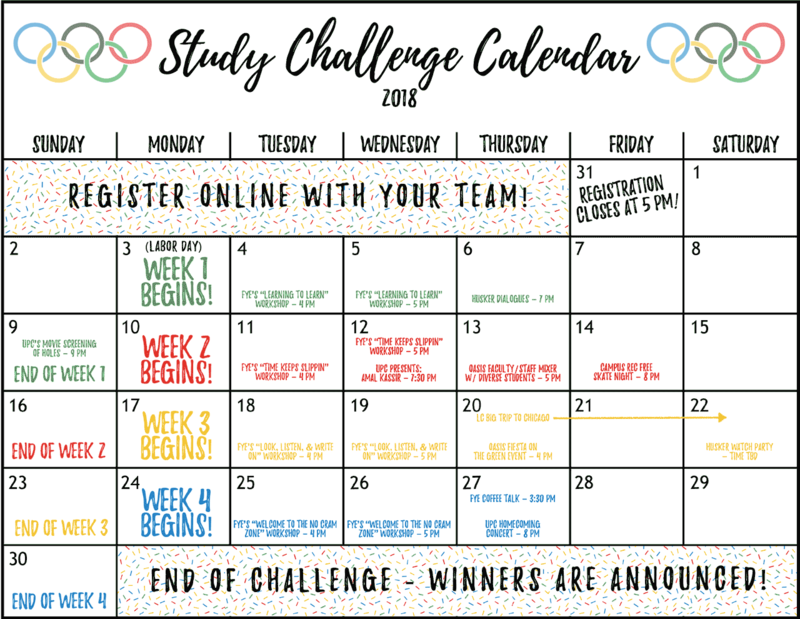 The Study Challenge begins on Monday, September 3rd, 2018 and ends on Sunday, September 30th. On the Monday of each week, tasks will be released for you to complete individually or with your teammates before the weekly deadline (Sunday). In order to move on to the next week of the competition, your must either complete one task from each category (five total tasks) OR complete seven tasks total between any of the categories. Once a task is completed, submit the item for proof on Canvas by completing the quiz for that task before that week's Sunday deadline. You will receive half points if you turn in your proof past the deadline. How is the Challenge Scored? The Study Challenge is scored both individually and by team. Each week, the tasks turned in by Sunday will be scored and current team and individual rankings will be posted. Team standings will be figured by averaging all team members’ scores to determine the team’s overall score. The last day to submit proof of task accomplishment will be Sunday, September 30th. Any tasks submitted after this date will not be considered. The winning teams and individuals will be announced during the first week in October! Prizes will be awarded to both teams and individuals based upon the scores accumulated by the end of the challenge. For all prizes, winners will be notified via email and each winner will be responsible for picking up their own prize. Throughout the competition, small giveaways will be awarded... keep an eye out for more details!